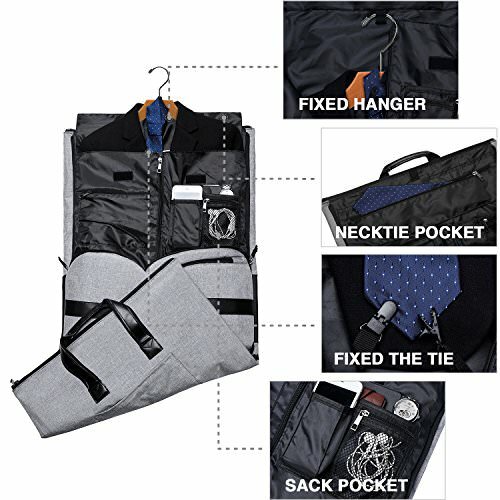 Take the hassle out of travel with the TRAVEL GARMENT BAG. Designed specifically for frequent travellers, this easy to carry bag is loaded with special features you won't find on just any bag. Keep your clothes wrinkle-free, your cosmetics spill-proof, and your souvenirs safe, whether you’re packing for a solo trip or for your entire family. This travel duffel bag is made of High-density water-resistant and tear-resistant oxford material and superior cowhide crazy horse leather. The amazing combine makes it become a great choice for outdoor, travel, vacation, beach or school. The zips, handle and strap is super strong and the main zip is easy for you to inserting and removing clothes or travelling necessities. This travel overnight bag has multiple interior pockets that help keep your things organized like smartphone, headset, keys, tickets, MP3.etc. This travel bag also has a good location to hold some important documents such as driving licences, passport or travelling tickets which is easy to get. Size: about 55 x 29 x 30 cm. Item is exactly as described. Received quite quickly within 2 weeks. Recommended seller and product!